Here is a list of some of our recently completed projects. The links above are to projects that no longer have non-disclosure agreements, so the descriptions are fairly detailed. The ones below have non-disclosure agreements still in force, so the information is limited to publicly available information. The picture on the right shows one of our recent projects that uses a Palm with built-in Bluetooth and a Bluetooth dongle to reinvent a product that previously relied on RS232 and a laptop computer. The product is an automotive exhaust gas analyzer that formerly dumped data to the laptop for collection, display, analysis, long term storage and report generation. Since this product is used for in-car testing while driving, the laptop solution is cumbersome to say the least. Now, the Palm takes over the data acquisition, display and short term storage functions. The acquired data is uploaded to a desktop PC for data analysis and record keeping. This solution greatly simplifies the testing and significantly reduces manufacturing cost. The blue box in the background holds a module known as a gas bench. 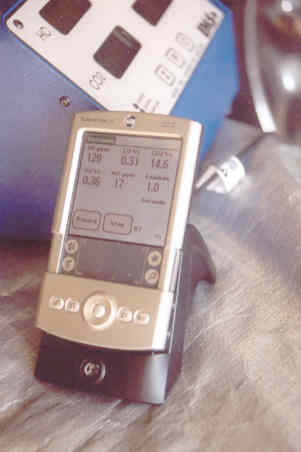 The bench uses infra-red detectors to monitor the exhaust gases of interest and convert the readings to numeric values. 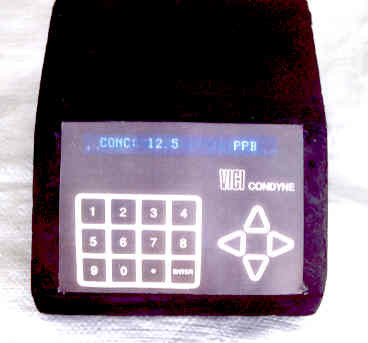 The picture shows a prototype design; the production units don't have the front panel display on the gas bench. The next picture shows the General Motors hydrogen powered HydroGen3. We wrote the software for the 53kW DC-DC converter. The converter changes the highly variable DC output of the fuel cell stack to the comparatively stable 3 phase AC power that the drive motor needs. There isn't a picture of the boost converter because it's a plain metal box. The converter fits on top of the fuel cell stack which is under the front hood on the right hand side. 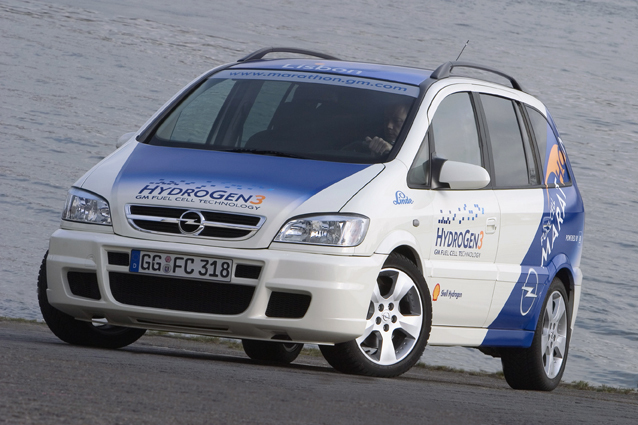 The HydroGen3 is a converted Zafira minivan from Opel. 53kW doesn't seem like much power (70 hp), but since the torque curve of an electric motor is very different from a gas engine, the performance is better than might be imagined. Our thanks to www.gmeurope.com for the picture. There are lots more pictures here. We worked on over a dozen projects for GM, but none of the rest have publicly available pictures. These projects consisted of software for other DC-DC converters, two different battery chargers for the EV-1, a power controller for an electric bus, a controller for an electric power steering module, a controller for a prototype hybrid gas electric vehicle and similar projects. These controllers used 68HC11, 68HC12, Infineon C167, and Power PC controllers. They used various combinations of CAN, J1850, and RS232 communication links. None had user interfaces of any sort. The next picture shows a gas flow controller for which we created the hardware, software, pc board layout, and front panel design. This product mixes a gas of interest with a carrier gas to an accuracy of 0.25%. At the time this product was created, this design was better than four times more accurate and much faster than anything else on the market. It also required no knowledge of gases to set up, while the competition relied on manual correction for barometric pressure and ambient temperature. In most applications, the mixed gas is delivered to a gas chromatograph in an analytical chemistry lab. We ended up doing three similar products for the same company. These products feature dot matrix vacuum florescent displays, stepper motors, very low level data acquisition inputs, very sensitive pressure transducers, and some pretty fancy math for a 68HC11. (Not pictured) Hardware and software for security gate controllers ( 7 projects for one company). These projects all used a 68HC11 micro-controller to control an AC motor. The user interface consisted primarily of switches, Hall effect sensors, and other Boolean inputs. (Not pictured) Hardware and software for LED replacement for incandescent displays ( 3 projects for one company). These displays had to be bright enough to be readable with the sun shining directly onto the display, and also dimmable so that they would not overwhelm night vision equipment. These designs use 68HC908 micro-controllers. (Not pictured) Software for proprietary format infra red universal remote control. In addition to sending commands, this product had to be able to learn and memorize the commands sent by proprietary IR controllers. It also had to be able to send its codes to another unit, with the second unit intended to be used in another room.